Dense Tule fog in Bakersfield, California. Visibility in this photo is less than 500 feet (150 m). Tule fog settled on an orchard in Stanislaus County in late December. Tule fog /ˈtuːliː/ is a thick ground fog that settles in the San Joaquin Valley and Sacramento Valley areas of California's Central Valley. Tule fog forms from late fall through early spring (California's rainy season) after the first significant rainfall. The official time frame for tule fog to form is from November 1 to March 31. This phenomenon is named after the tule grass wetlands (tulares) of the Central Valley. Tule fog is the leading cause of weather-related accidents in California. Tule fog is a radiation fog, which condenses when there is a high relative humidity (typically after a heavy rain), calm winds, and rapid cooling during the night. The nights are longer in the winter months, which allows an extended period of ground cooling, and thereby a pronounced temperature inversion at a low altitude. 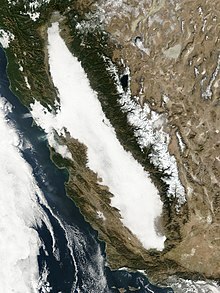 In California, tule fog can extend from Bakersfield to Red Bluff, covering a distance of over 650 kilometres (400 mi). Tule fog occasionally drifts as far west as the San Francisco Bay Area via the Carquinez Strait, and can even drift westward out through the Golden Gate, opposite to the usual course of the coastal fog. Tule fog is characteristically confined mainly to the Central Valley due to the mountain ranges surrounding it. Because of the density of the cold air in the winter, winds are not able to dislodge the fog and the high pressure of the warmer air above the mountaintops presses down on the cold air trapped in the valley, resulting in a dense, immobile fog that can last for days or at times for weeks undisturbed. Tule fog often contains light drizzle or freezing drizzle where temperatures are sufficiently cold. Tule fog is a low cloud, usually below 2,000 feet (600 m) in altitude and can be seen from above by driving up into the foothills of the Sierra Nevada to the east or the Coast Ranges to the west. Above the cold, foggy layer, the air is typically mild, dry and clear. Once tule fog has formed, turbulent air is necessary to break through the temperature inversion layer. Daytime heating sometimes evaporates the fog in patches, although the air remains chilly and hazy below the inversion and fog reforms soon after sunset. Tule fog usually remains longer in the southern and eastern parts of the Central Valley, because more winter storms affect the northern Central Valley. Visibility in tule fog is usually less than an eighth of a mile (about 600 ft or 200 m). 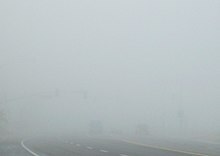 Visibility can vary rapidly; in only a few feet, visibility can go from 10 feet (3.0 m) to near zero. The variability in visibility is the cause of many chain-reaction pile-ups on roads and freeways. In one such accident on Interstate 5 near Elk Grove south of Sacramento, 25 cars and 12 big-rig trucks collided inside a fog bank in December 1997. Five people died and 28 were injured. In February 2002, two people were killed in an 80-plus-car pile-up on State Route 99 between Kingsburg and Selma. On the morning of November 3, 2007, heavy tule fog caused a massive pile-up that included 108 passenger vehicles and 18 big-rig trucks on northbound State Route 99 between Fowler and Fresno. Visibility was about 200 feet (60 m) at the time of the accident. There were two fatalities and 39 injuries in the crash. Tule fog events are often accompanied by drizzle. Because of the lack of sunlight penetrating the fog layer, temperatures may struggle to climb above freezing, and episodes of freezing drizzle occasionally accompany tule fog events during winter. Such events can leave an invisible glaze of black ice on roadways, making travel especially treacherous. ^ "Fog in California". NASA. Archived from the original on 6 March 2013. Retrieved 10 March 2015. Davis, CA Tule fog — featured in Orion Magazine.